You’re typing away on your computer most of the day — perhaps while at the office or school – and you want to check in on your favorite social network. If it’s a mobile-focused platform like Instagram or Snapchat, however, you’re out of luck. Or maybe not. There are, in fact, a couple of ways you can access these smartphone-centric social media sites on your Windows PC or Mac. With Instagram, you can go to the Instagram website (instagram.com), sign in with your Instagram ID, and view photos of your feed. But be forewarned this is a half-baked experience as you can’t post photos or videos. It’s merely an Instagram viewer. Similarly, PC users can download the official Instagram app for free from the Windows Store, but posting and editing photos is only available for tablets and PCs with touchscreens and backward-facing cameras. Sigh. Instead, to give you the mobile Instagram experience you know and love – while sitting at a computer during the 9-to-5 grind — download the free BlueStacks, an Android emulator for PC and Mac, which lets you run Instagram and other Google Play apps on your laptop or desktop. In fact, the Android operating system doesn’t even know it’s being run on a computer. After you download and install the 300MB BlueStacks (bluestacks.com), sign in with your Google ID and then click on the Google Play store icon to search for and download Instagram. Now sign into the Instagram app with the same ID and password as your mobile phone, and you can take a photo or shoot a video – via your webcam – and post it to your feed. You can also add filters, share multiple photos and videos to your story (and jazz them up with text and drawing tools), see what your friends are sharing, post comments, send disappearing media and words to others (through Instagram Direct), and more. 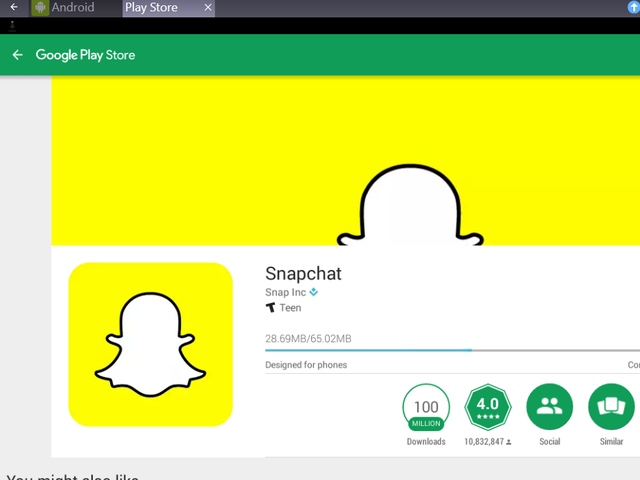 Unlike Instagram, there is no Snapchat.com viewer that lets you see your feeds, nor is there a Windows 10 app for Snapchat like there is for Instagram (as limited as it is). Mac users are also out of luck. Therefore, you’re limited to using an Android emulator like the above mentioned BlueStacks, which is free and easy to use, or consider another free emulator like AndyOS (andyroid.net), which also works on both Windows and Mac. After you’ve downloaded and installed an emulator, sign into your Google account, and then click or tap to go to the Google Play store. Search for and download Snapchat, and then sign into your Snapchat account, as you would on an iOS or Android device. You only need to do this once. You’ll be up and running in seconds. Now that you’re in Snapchat, you can view your friend’s Snaps or send one if you have an internal or external webcam (required) on your Windows PC or Mac. Add fun filters to your photos before sharing, send messages to friends (with fun emojis), click or tap Discover to explore hand-crafted Stories from top publishers in the world, or view Memories, a personal collection of your favorite Snaps and Stories.